Members of the family that made contact bombs in Monimbo are imprisoned. Relatives of the true “Julian el Monimboseno” (from Monimbo) state how they were taken. “Julio is over there—Socorro points towards the door in a small living room, where the old man is bent fixing a broken lock with a screwdriver—the police threw down the door, but they did not take Julio as they are saying.” Julio Garcia, 76 years-old, is the famous “Julian el Monimboseno”, the celebrity who “made rope-bombs for the revolution,” according to the lyrics of Carlos Mejia Godoy’s song, “Viviras Monimbo” (Long-live Monimbo). The person captured by the riot-police on the morning of Saturday, October 8th, in Monimbo, was Julio’s brother Lazaro Garcia, who is 72 years old. The media identified Lazaro as “Julian el Monimboseno.” The confusion has nothing to do with the fact that both of them look alike (wide nose and sincere look) or that both are historic fireworks producers of Masaya, and are also neighbors. Actually, Lazaro likes to pose as the character of “Julian el Monimboseno,” since a few years ago. Lazaro García posing as “Julian el Monimboseno” in front of the cameras of the dictatorship’s media outlets in February of 2018. Courtesy. The family of Julio Garcia assures that he “never liked to appear in public.” He was invited to Sandinista activities to pay homage to the inventor of the contact bomb, but he preferred not to go. 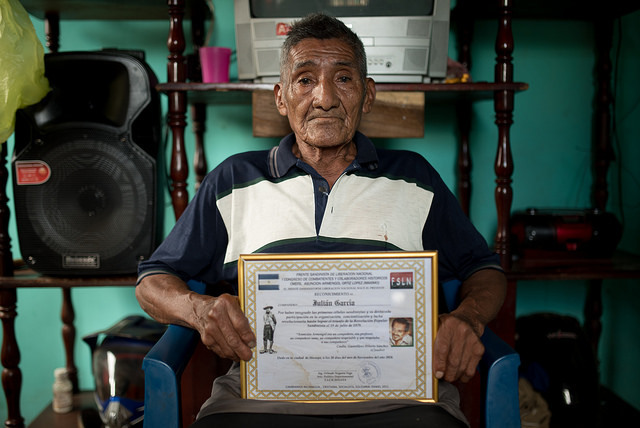 Once, the Sandinistas of Masaya, headed by Mayor Orlando Noguera, offered hearing aids for Julio Garcia’s deafness. However, one of Julio’s sons (who prefers not to give his name because he escaped from being arrested on Saturday) told Confidencial that it was his father who received Carlos Mejia Godoy, when the composer still wore “those bell-bottom pants.” The pyrotechnician introduced himself to the singer as “Julian” out of mere distrust and told him the story of the bombs under that nickname. After “Julian el Monimboseno” became a myth, both brothers continued with the craft of gunpowder. “The ingenuity of (Lazaro) Garcia, contributed to achieve the victory of the people, which today is seen by him and his children as protagonists, who enjoy peace, freedom and restored rights,” published the government’s “El 19 Digital” on February 18th. While the magazine “Vision Sandinista” did it also on the same month. With the framed acknowledgments given to them by the Sandinista party, and regardless of the character of “Julian el Monimboseno,” the immediate relatives of Julio and Lazaro feel “threatened and betrayed” by the “illegal arrest” of seven members of the pyrotechnic clan. The riot police broke into the house of these artisans of gunpowder on Saturday, and took away Lazaro Garcia, Lazaro Garcia (son) and Alexander Perez (son-in-law). The officers also entered the house of Julio Garcia and captured Martin Suazo, Edwar Suazo (son of Martin) and Dany Garcia (son of the pyrotechnician), when they were building a dog house. On Sunday Alexander Perez, the Suazos and Dany Garcia were released. However, the freedom for Dany Garcia did not last long. On Sunday night he was arrested again after his wife, Ruth Ester Matute, was apprehended during the day when she went to leave food for him at the Masaya police station. The eleven-year-old daughter of Dany Garcia accompanied her mother to leave the food, when the officers seized the woman. “They left her alone, crying outside the station and she called us to go pick her up—says her grandmother Socorro Corrales— “then they came at night to take Danny away by trickery. They told him that if he did not go with them, they would not release Ruth…now we do not know where he is, if he is here in Masaya or in El Chipote”, the feared interrogation prison. Kenia Garcia, granddaughter of Lazaro Garcia, asserts that her grandfather was beaten by the riot-police. The detainees were transferred to the cells of El Chipote. The relatives of the artisans, Julio and Lazaro, do not understand why they were apprehended. The gunpowder workshops of both men have not been operating for more than four months. When the protests against the dictatorship of Daniel Ortega began, they sold “morteros” (explosive gunpowder wrapped in paper launched from a tube, used to scare the opponent) to the demonstrators. They do not deny it. This fireworks family assured that they did not sell contact bombs to either side because they were not “manufacturing them.” That is why they categorize as absurd to incriminate them for it, when the making of contact bombs became popular domain in the gunpowder workshops of Masaya and among the rebels against the Ortega dictatorship. The Garcia family assures that the students themselves bought gunpowder and made the bombs at their campuses or barricades. But, instead of making them with adhesive tape (which is the most dangerous method), they used small glasses of “Gerber.” Anyone can make a contact bomb; whose explosion equals the power of four mortars together. Several paramilitaries of the Ortega Government were seriously wounded in Masaya when they were dismantling the barricades. The rebels in that city left contact bombs under the cobble stones used to make the barricades. When the power shovels knocked down the cobblestone, the explosion would hit the hooded men armed with rifles. Old Julio, the one that the family claims to be the true “Julian el Monimboseño,” has lived this rebellion against the Ortega dictatorship without listening to the rebellious explosions caused, once again in Masaya and against another dictatorship, by the bombs that he invented decades ago and which helped to liberate Nicaragua. The “cricket-like sound in his ears” has withdrawn him to a sound reality of his own, oblivious to the detonations. On the verge of senility, silence is light. The imagination of “Julian el Monimboseno” is dazzled, he does not hear.